Even some 2012 proponents recognize that an exact alignment between the center of the Galaxy and the solstice Sun is impossible. The "Solstice Sunrise Alignment" of Izapa's famous Ballcourt is problematic. 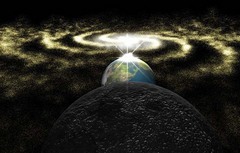 Many 2012 proponents claim that on December 21, 2012 an alignment between the Earth, the Sun and the geometric center of the galaxy will occur because of precession, and that this alignment will cause something to happen. John Major Jenkins has given several different versions of the Solstice alignment of 2012. For example, he contends that the Maya configured their calendar to this date because they believed that the sunrise on the day of the solstice would rise through the dark rift, which is a clearly visible feature in dark skies.2 In his view it is not an 'exact' alignment, but a close one. Now, a lot rides on the meaning of the word "exact" in this context. As far as an exact alignment with the plane of the milky way, that occurred in 1998. Jenkins himself acknowledges this fact3. Even this was not an "exact" alignment with the center of the milky way. That did not happen in 1998, and it will not happen in 2012. An 'exact' alignment isn't possible, because the center of the Galaxy is not in the plane of the Earth’s orbit. It’s off by about 5 and 1/2 degrees. As a comparison, the disk of the sun is about 1/2 a degree across. This means that the sun will be 11 times its own diameter away from a line through the center of the galaxy on December 21, 2012. The line of the Earth and Sun comes close to alignment with the center twice a year, on the solstices. Of course, we remember the plague of locusts, major famine, death and destruction raining from the skies every December and June 21st, don't we? Oh? We don’t? No ill effects noted so far, no swarm of earthquakes, no plagues of locusts? Funny, that. The so-called "Galactic Equator", which 2012 proponents sometimes call (even more erroneously) the "galactic ecliptic", is a source of great confusion. We clarify it here. The following is, for the most part, a summary of what you'll find at that link. We emphasize that the galactic equator is a human construction, and in fact is a modern human construction (1959). It has no real meaning other than to give us a frame of reference. The above having been said, the Galactic Equator isn't truly "arbitrary": it is about a tenth of a degree off-parallel from an important feature called the "H1 plane" of the Milky Way Galaxy. That small misalignment was a conscious choice, made for mathematical convenience. As we explain here, the Sun does not align with the H1 plane on the 2012 Winter Solstice. Nor does it align with the "Galactic Equator", as we'll now show. At the left is an image taken from one of the 2012 proponent sites. It purports to show the positions of the solstice sun 3000 years ago, 1500 years ago, and in 2012. If this was all you had to look at, you might be tempted to agree with the conclusion at the site, that there will be a spectacular and rare alignment on December 21, 2012. However, a frequent poster in the Yahoo!Answers ‘Astronomy & Space’ forum, Geoff Gaherty, has a good article that was published in the Starry Night Times newsletter where he debunks this particular claim using Starry Night software, including much higher resolution images than the proponent site uses. We encourage you to look at his article and see for yourself that an exact ‘alignment’ is pure bunk. Again, we are dealing with the claim that the solstice sun aligns exactly with the center of the galaxy. It does not. If, on the other hand, the proponents claim (as Jenkins does) that a close alignment is what is being discussed, then why should it be limited to the year 2012? We should have been seeing the 'effects' of this alignment since at least 1998! The Group F Ballcourt at the Izapa archaeological site is of intense interest to 2012 proponents, especially John Major Jenkins. Jenkins's own work shows that that Alignment occurs for about two weeks in every December, for approximately 2,000 consecutive years. As Jenkins himself acknowledges in the last few paragraphs of this article, the alignment of the Ballcourt is "actually a degree or two" off. That doesn't sound like much, but it corresponds to a difference of several days in the timing of the alignment. Aveni notes this on p. 82 of , and Jenkins notes it in the last few paragraphs of this article. As a consequence of that timing, the Winter Solstice is actually one of the days of poorest alignment of the Ballcourt to the sunrise during December. In conclusion: An exact alignment with the center of the galaxy is impossible. We have shown that on the December solstice, 2012, the sun will be nearly 6 degrees away from the geometric center of the galaxy, or about 11 solar diameters. 2. Anthony Aveni, an astronomer and Maya researcher, gives a good, readable discussion of this issue in pp. 53ff of . One of Aveni's objections to Jenkins' assertion that the Solstice alignment was important to the Maya is that Jenkins bases that assertion upon a solstice alignment of a single ballcourt at Izapa, which was an early, peripheral non-Maya site. In summary, the ballcourt on which Jenkins pins all his conclusions is in a site whose importance is unclear. Moreover, that ballcourt's alignment with the solstice direction is much less precise than he commonly implies. 1. Aveni, Anthony. 2009. The End of Time: The Maya Mystery of 2012, University Press of Colorado, Boulder. Available online at http://books.google.com.mx/books?id=zUfOSF0s6BMC.